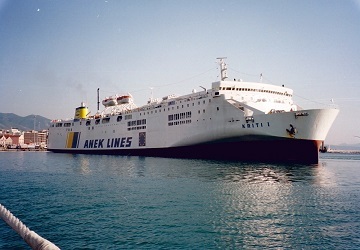 Anek Lines operates a large number of ferry crossings between Italy and Greece, as well as within the numerous Greek Islands. A winner of many shipping awards since their inception nearly in 1967, Anek Lines is the largest shipping company in Greece, and the parent company of many leading operators in the Mediterranean. 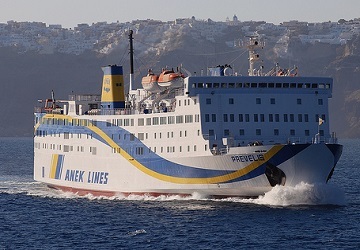 Anek Lines’ international ferry services run from the Italian ferry ports of Venice and Ancona to Igoumenitsa, Corfu and Patras, while domestic ferry services operate in Crete, the Dodecanese and Cyclades regions. 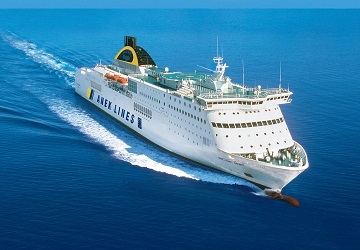 The Ancona routes and the crossings between Piraeus and Crete are operated in a joint venture with Superfast Ferries. The fleet is contemporary and adheres to high standards concerning safety and quality, containing all the amenities associated with a leading ferry company. The flagship, F/B Elyros was acquired in 2007, winning ‘best reconstruction’ at the 2008 ShipPax Awards, having been made made of the most environmentally friendly materials and offering superb facilities. The rest of the fleet is made up by equally high-tech vessels including Venizelos, Olympic Champion, Hellenic Spirit, Kydon, Kriti I and II, and Prevelis. Directferries.com provides an impartial ferry comparison service allowing you to view numerous ferry company timetables and fares in one quick and easy search. Compare Anek Lines timetables and prices now with all alternative ferry operators before booking your ferry ticket. The ferry was more like a luxurious cruise ship....clean, quiet, comfortable, and no shortage of friendly, helpful and competent crew. Food and eating options were just fantastic as were the catering facilities. Of my many ferry trips, this was easily the best service I have been on. "outbound Ancona-Corfu perfect, nightmare return"